Some homeowners may think that the space under the stair is a dead end. There is nothing they can do with it except cramming things in it. Nothing could be further from the truth. 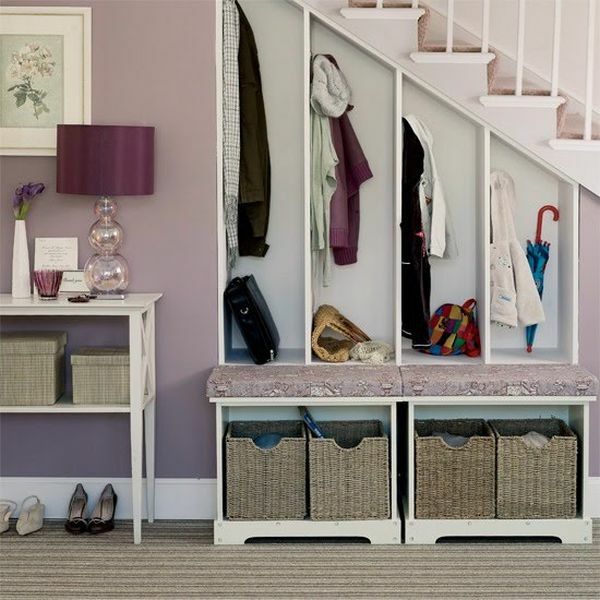 Here are 10 under stair storage ideas that can make your house look stunning. Are you cheesed off with your working atmosphere? Why don’t you try a new working space? This working area is such a brilliant solution for limited space. 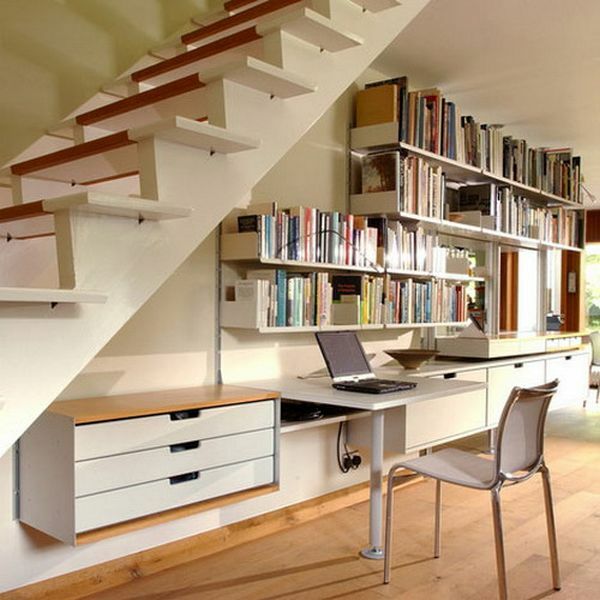 If you do not have an extra space for a working area, you can always rely on the space under the stair. You can still work comfortably without taking up more space of your house. This working area enables you to store books and files that you need. It also provides sufficient space on the desk top so that you can put your laptop and spread your books out on it while working or doing your homework. Relaxing in a quite place while enjoying your favorite magazine is such a great me-time for you, isn’t it? 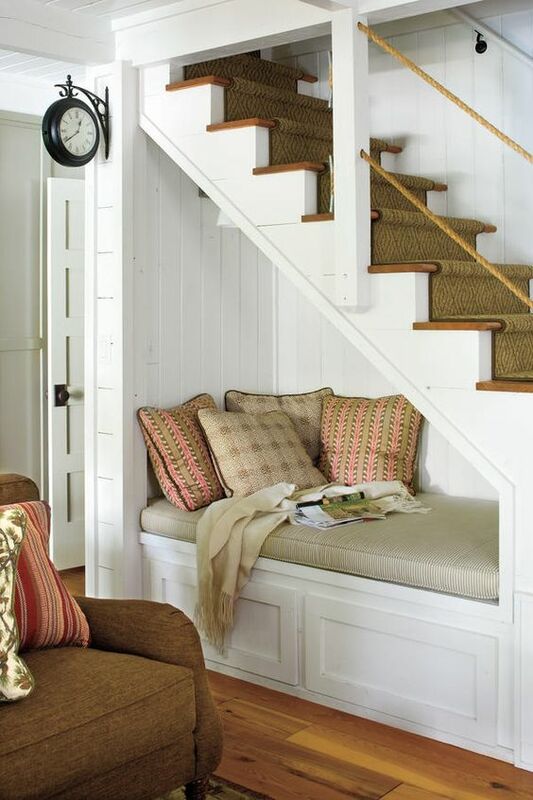 You can realize it by creating a relaxing nook right under the stair. Well, it is not that big, but that is what you are looking for, right? A small and safe haven for relaxing and just being yourself. There is nothing can beat this relaxing nook when it comes to indulging yourself. Pro : It is such a great private place for reading, relaxing, or even slurping a cup of tea. Con : It may be so cramped that you cannot move your body freely. There is nothing wrong with being fashionable. However, the real problem come when you do not have enough space to store your clothes and shoes anymore since your closet is already full of your fashion items. 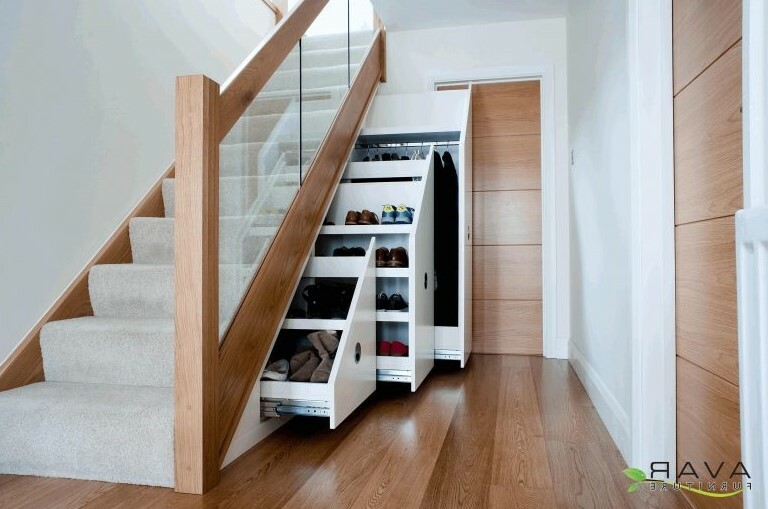 You can use the space under the stair to store some clothes and shoes neatly. You will need your basic DIY skills to make a wardrobe and shoe rack that can be pulled out easily. Although it may take time to build this wardrobe and shoe rack, the result will satisfy you as well as spruce your house up. When rain comes, you get wet and step on a few puddles on the way home that make you look messy. Another messy thing occur when you enter the hallway of your house with muddy boots and water dripping from your coat. Instead of purchasing a rack stand that holds your coats and hats, why don’t you occupy the space under the stair? A built-in coat rack fits perfectly under the stair. It helps you to hold the clutter caused by your wet coats and muddy boots at bay. It is such a go-to rack that enables you to put the things that you usually bring along when you are outside. Hint : Add more hooks so that you, as well as your guests, can hang more wet hats and coats. A fierce storm is happening outside. You don’t want your dog to get trouble by letting him sleep outside, do you? But you don’t want him to mess the house up, either, right? 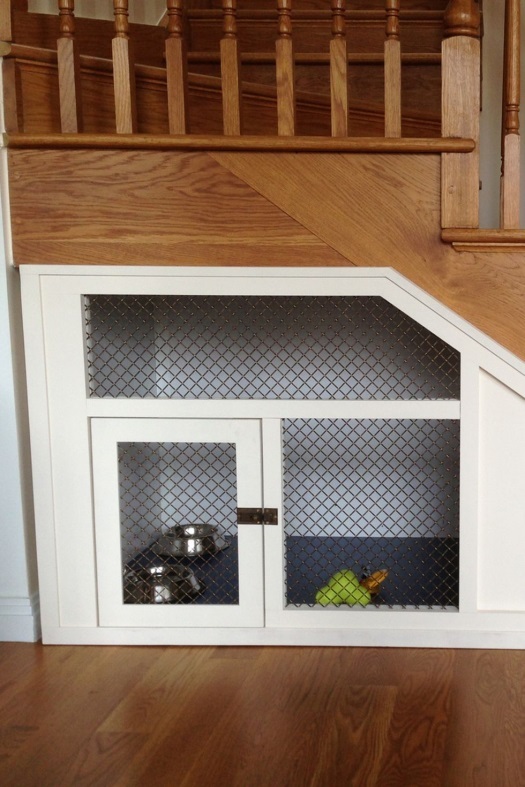 Now you can build a shelter for your beloved dog right under the stair. This dog haouse is a safe haven for him. It can keep him warm and safe during the storm. 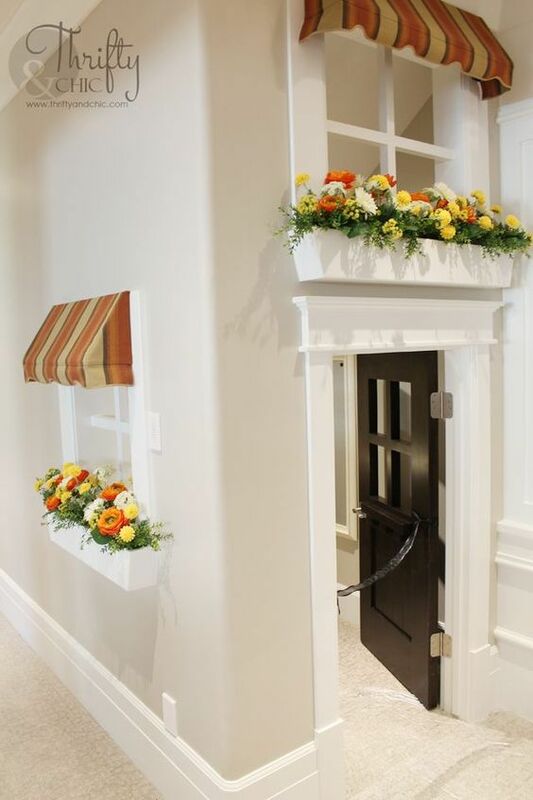 If you are worried about the mess that your dog might do when letting him wander around the house, you can install tier doors. They will make your dog stay in his kennel. 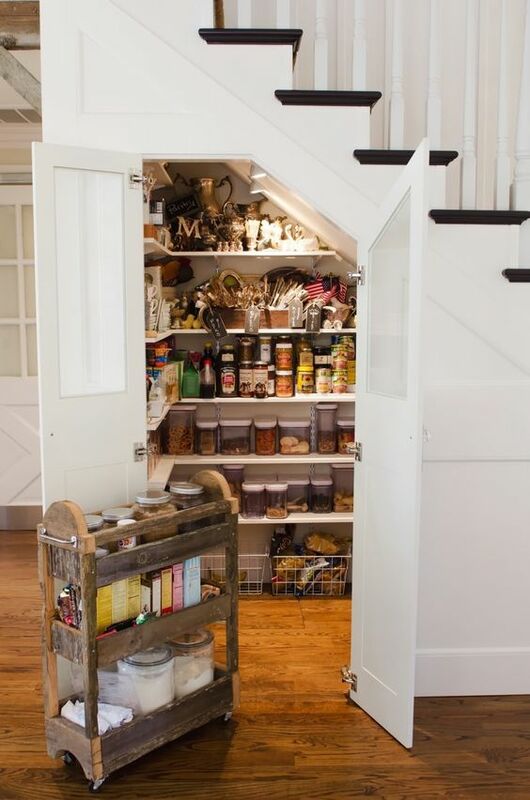 If you don’t have enough space to store cookware, jams, sauces, and foods because your kitchen cabinets are already full, try a much bigger and affordable cabinet – DIY kitchen cabinet under the stair. It is like a closet in which you can store your fashion items. This smart pantry can help you organize all of your cooking utensils and sauces. It is more affordable than buying some small cabinets in a store. Besides, adding more cabinets mean taking up more space which is not really good for your small kitchen. 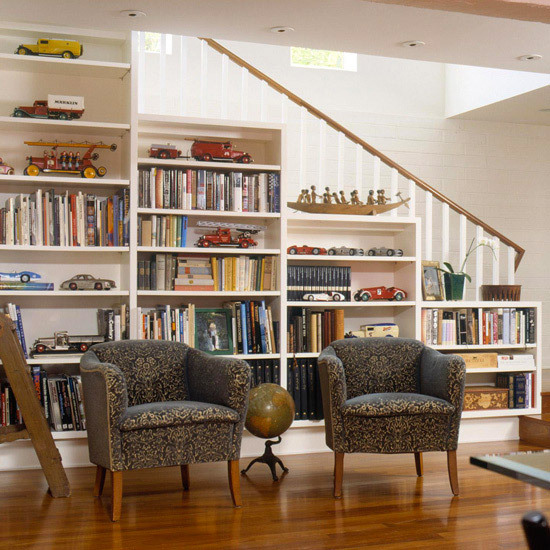 When it comes to limited space issue, under stair storage can be your greatest bet. It can be occupied for various kinds of purposes including a chic powder room. 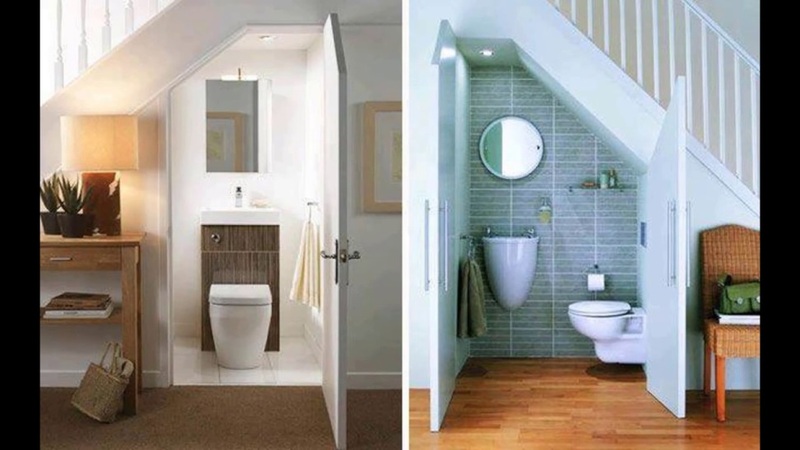 These powder rooms still look awesome although they are built under the stair. They still provide sufficient space for you to step in and out without compromising the stylish interior. Despite being small powder rooms, they still have to look good, right? Hint : Using a white LED lamp for the lighting can make the powder room look less cramped. This storage rack is the top-notch one because it can hold many books and your kids’ toys. And the most important thing is it does not take up a lot of space in your house in that you buid it under the stair. Building this rack is quite easy. You can purchase some racks and simply place them right under the stair and tweak them a little bit so that they fit the space under the stair perfectly. But if you want to salt away some money, building your own rack using some leftover can be a great idea. When there is not much space left under the stair, it does not mean you cannot do anything with it. This recreational spot can be such a great idea for the limited space under the stair. 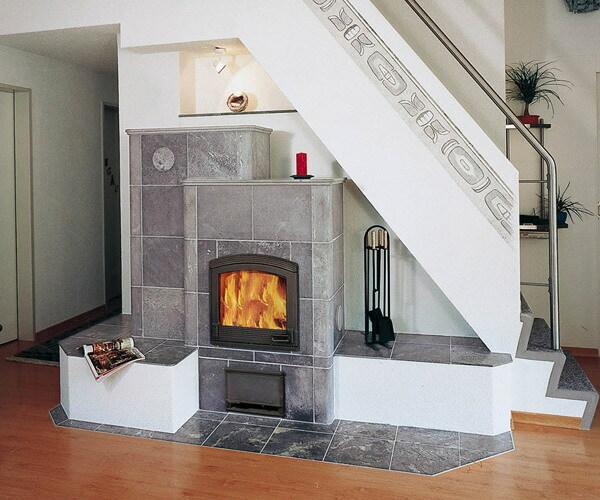 Turn the tedious look of the space under the stair into a focal point that can amaze anybody who sees it. The glaring fire is pretty conspicuous so that people will not miss it. Let your kids enjoy being at home by building them their private playground under the stair. Now they have a place to play while exploring their imagination right inside the house. Pro : Since they are playing inside the house, you can hold your worry at bay and have an eye on them. Con : They will feel bored easily since the space under the stair is not quite big. There are many ideas that you can apply for your under stair storage. And it is always a good thing to keep things organized without taking up a lot of space. So, which under stair storage idea that suits your style well?